Apple Coffee Cake & Happy Thanksgiving! I am greeted by my greasy reflection, while sitting in front of a mirror to type this entry. The loose t-shirt I have on, is glued uncomfortably to my back. In case you are wondering, I am far from the dry and cold winter in the northern hemisphere. And yes, we are back to the hot and humid foodies paradise- Singapore! In my rush to clear up the fridge content before our 3 weeks vacation, I baked this lemon yogurt cake. Instead of our usual travel companion-banana cake, we have this to snack on board the 20 odd hours flight. The lemon yogurt cake recipe originated from one of my favorite cookbook author- Ina Garten. Her lemon cake recipe is one of the early recipes I have tried when I first started baking. It is also one of my all time favorites. Her lemon yogurt cake uses the same technique of brushing lemon syrup onto the hot cake, which assures that the cake stays moist and packed full with lemony flavor. The kind of cake that I would gladly eat anytime of the day. Instead of using whole milk yogurt, I used the greek yogurt samples I got from Stonyfield Farm. I added 2 containers of the 5.3 oz Oiko organic Greek yogurt, which was slightly more than the recipe indicated. Because I remember having lots of syrup leftover when I made the lemon cake last time, I simply used the juice from 2 lemons, in which the zest had been added to the batter earlier on. For the convenience of packing, I made the cake with my mini loaf pan and did some personalization with each. Frozen blueberries were added to one mini pan, making that a lemon blueberry cake. The next one has poppy seed in it, making it a lemon poppy seed cake. I left one au naturel, and one with lesser poppy seed in case OCT decides he doesn't like poppy seed. Preheat the oven to 350 degrees F. Grease and flour an 8 1/2 by 4 1/4 by 2 1/2-inch loaf pan or the mini loaf pans. Sift together the flour, baking powder, and salt into 1 bowl. In another bowl, whisk together the yogurt, 1 cup sugar, the eggs, lemon zest, and vanilla. Slowly whisk the dry ingredients into the wet ingredients. With a rubber spatula, fold the vegetable oil into the batter, making sure it's all incorporated. Pour the batter into the prepared pan. 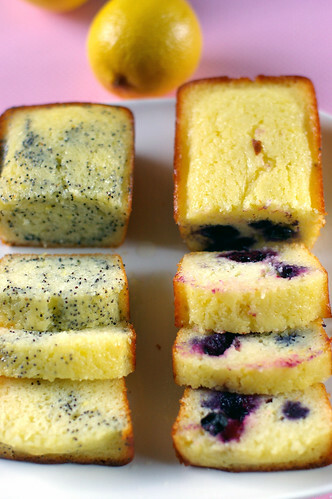 Add in your preferred add on ingredients (poppy seed or blueberries) and bake for about 50 minutes, (if you are using the big loaf pan) about 25-30 minutes (if you are using smaller pans),or until a cake tester placed in the center of the loaf comes out clean. Meanwhile, cook the 1/4 cup lemon juice and remaining 1/4 cup sugar in a small pan until the sugar dissolves and the mixture is clear. Set aside. I love this cake! Your pictures turned out great...making the cake look super moist! Eerk! Airline food is the worst. Cathay Pacific is the only one I've ever liked-- and only the breakfast. Give me one of those cakes anytime, though! Doesn't matter which "flavor"-- I love them all! Amazingly delicious! And what a great treat to have on a flight! Oh Lucky you!! Enjoy the good food and time with family. Eat an extra portion of hawker food for me! Great to see your post on the lemon yogurt cake. I was just thinking of giving the recipe a try since I just checked out the Barefoot Contessa cookbook from the library. Good to know you've had good results from it, though I've found Ina Garten's recipes pretty good and easy to make generally. Also, I wanted to thank you for the clarification regarding the plums for your Plum tart recipe. I made it for a party and got some great compliments. Thanks. Yumm! I'd eat that poppy seed cake in one bite! my mother in law LOVES lemon cake, I'll have to try these recipes. I love that you used Greek yogurt! i heard abt horrible things abt UA food heh Enjoy your holidays back home!! They look too pretty! Have a great vacation! Welcome back, and hope you have a great time here! These look lovely! I love Ina Garten's recipes too. You did an excellent job. Have a great vacation! This is the absolute recipe for me. I LOVE everything with yoghurt and lemons. And the pictures are beautiful! I love the purple tone in this image. so lovely! Gorgeous and delicious looking cakes! This looks uber yummy delicious! It's so moist and I can feel the lemonny taste already. I'll bake this when I get back to Malaysia. *hands up* I agree that airline food is the worst and I often get hungry before they serve the next. 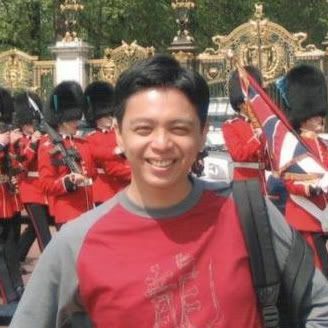 Enjoy Singapore while I cant wait to cross the Tebrau Straits. I gotta try your recipe at home, looks delicious!!! Looks good!! 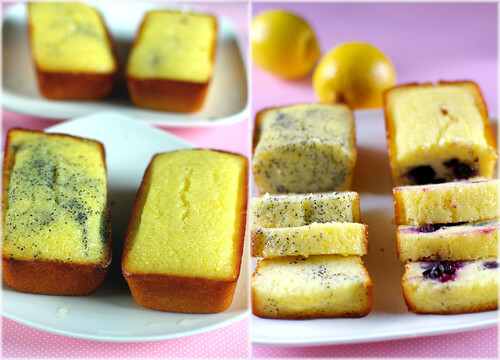 I haven't tried lemon yogurt cake before...a must try for me! Have a wonderful vacation! Stopping by via Tastespotting...you have a wonderful blog! Mmm that looks rather good! These look delicious!I've got frozen blueberries in the freezer from this summer and they're waiting to be used. All i need to do is buy some yogurt and bake...i'll definitely try this recipe! My co-blogger also made Ina's lemon yogurt cake. Yours and hers turned out very differently but they all look absolutely delicious! Not that anyone would need further confirmation after viewing those lovely photos, but just wanted to say I too love the Lemon Yogurt Cake recipe. It is an even-better, from-scratch substitute for the "lemon poke cake" of my childhood. I allways love mini loafs! They're lovely, both versions! Enjoy your trip! YUM, those looked so moist and delicious! Greetings from Central NY...a far cry from Singapore! 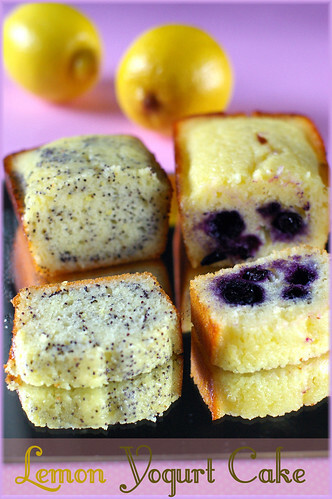 These lemon cakes look so good. We are driving to Atlanta for Christmas and I am going to tuck some of these in the car with us for a snack. I will be making that yoummy looking coffeecake at my daughter's over the holidays! I made this cake today. Unfortunately, it was far from nice. I threw the whole loaf away after my nephews and family members refused to eat them. How long did u whisk your yogurt mixture for? I assumed that since u didn't specify, it should be less than 2-3 mins correct? I am sorry that your loaf cake didn't turn out well. I whisk everything until they are just combined. I didn't really notice how long it took. Did you use Greek yogurt/full-fat yogurt? I had a similarly bad experience when I used the non-fat yogurt once. The final texture did turn out rubbery. Thanks for your reply. I did what u did, whisk till combined. U mentioned 2 containers of 5.3oz of yogurt right? So total yogurt used would be 10.6oz? My cake turned out awesome. My digital scale does not give me 10.6oz (what is that in a fraction - 6/10? lol) so I used 10.75 oz (it took a little longer than 50 mins to bake) and frozen blueberries. During painting my house I threw away my old flour sifter so I used my regular fine mesh strainer. i have a really importanly question i am from switzerland and wanted to ask how much 2 containers of 5.3oz greek yogurt in grams do you know this? pls give me quick an answer! Just finished making two loaves. One Poppy Seed and the other with Cranberries. has enyone ever tried to use regular liquid yogurt? it has better taste but its not that firm, and would the amount of it be the same as the greek?